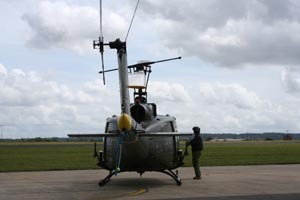 Huey 509 had been left hangared at Thruxton after the previous event at ATC Lasham. Keith Thomas drove from a business appointment at Wycombe Air Park and stayed over at Rob & Gwyn Tierney’s on the evening before the Event. The weather that evening was poor and our hopes for the morning were not high. Thankfully the day dawned clear and sunny if a little breezy. At Thruxton we were joined once again by our ‘Southern Support Team’, Tracy and Douglas Fitchett-Bowen, who helped extract 509 from the hangar. The winds were close to the rotor start limits for 509 but, thankfully, not outside them. Rob flew the leg to Odiham and we were marshalled to our spot where we were to spend the day on view to the families before flying our 6 minute display. 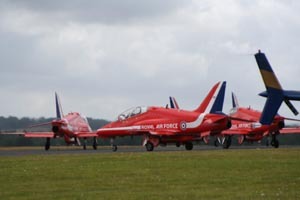 The strong wind meant that the Flying Programme was under constant review and the slot for 509 kept being delayed. 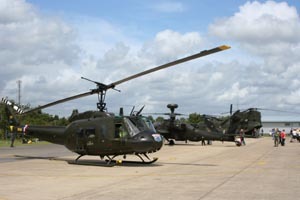 The Event Display was excellent with many fixed wing items as well as other helicopters. 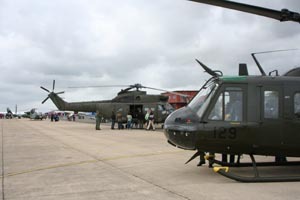 Particularly of note were the Reds, Vulcan, Super Sabre and, of course, a very spirited Chinook display. 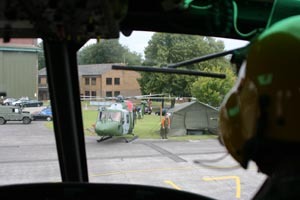 Plenty of interest was shown in 509 including some from folks who had flown Hueys. 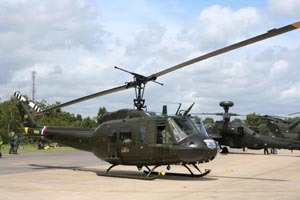 One of these had been in the Omani Air Force where Keith gained his Huey experience. The slot time for 509 had now been pushed back to a point where if we flew the display we would possibly fail to make Halfpenny Green, our refuel stop, before it closed. Although saddened by this outcome the prudent course of action had to be taken as the Met Office was forecasting areas of heavy rain on our route which could further delay our progress. Sadly we therefore had to accept our refuel and depart in a gap in the display after the Vulcan had cleared the circuit. Keith flew the leg home, which was Odiham – Thruxton, to drop off our faithful support crew, then to Halfpenny Green for fuel before the final leg to Wesham. Although we did see areas of rain we were fortunate that none of these were on our track and our flight home was uneventful. On arrival at Wesham, Phil, who was enjoying his temporary “batchelor” status as Jo was away on a cruise with her mother, met us to put 509 away. After a traditional “boys” curry night out Rob & Keith drove a hire car back to Thruxton the next morning to reclaim their own cars and head home. 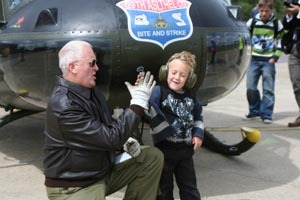 In summary it was a shame that we lost our display slot but plenty of people had the opportunity of seeing Huey 509 “up close and personal” and the whole crew had a very enjoyable and fun day out.